Love farmhouse? Me, too! Love Christmas? Ditto! I'm getting obsessed with the vintage, rustic look. 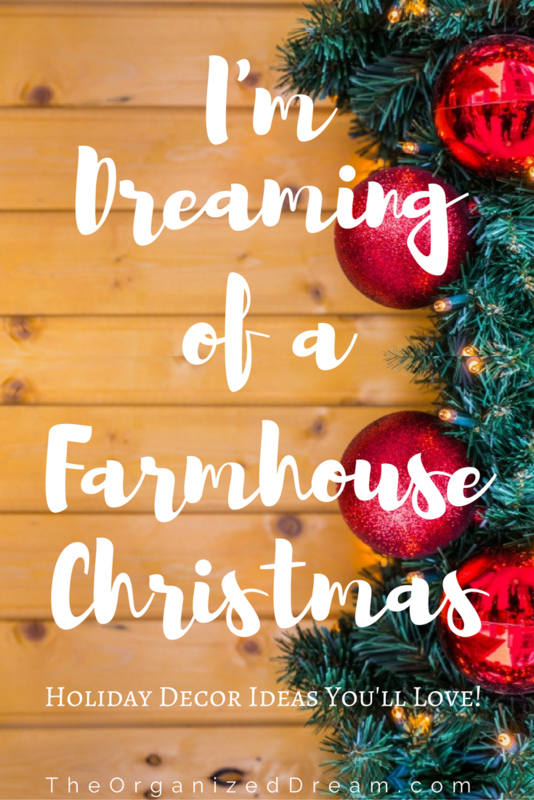 This quick little round up features 10 fabulously beautiful farmhouse Christmas decor ideas that I absolutely love! 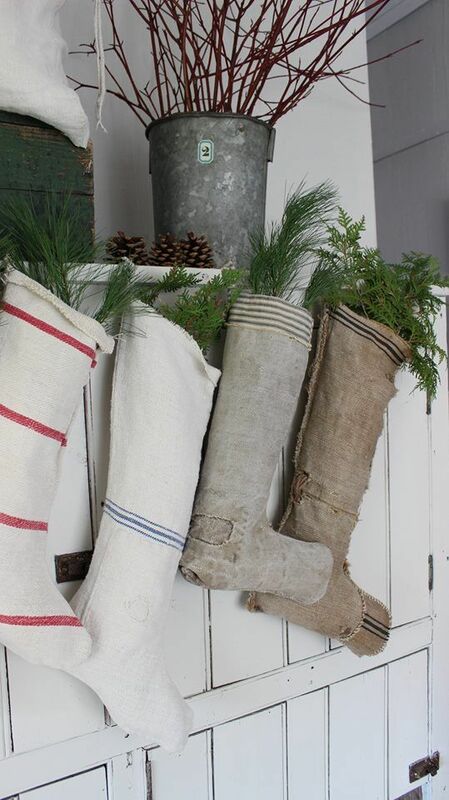 These stockings look worn and faded but at the right kind of rustic touch for a cozy farmhouse Christmas. I discovered this image on Pinterest but sadly can't find the original source because it doesn't link to anything. If you have an idea of where it came from, shoot me a comment below. I really want to see more of this space! 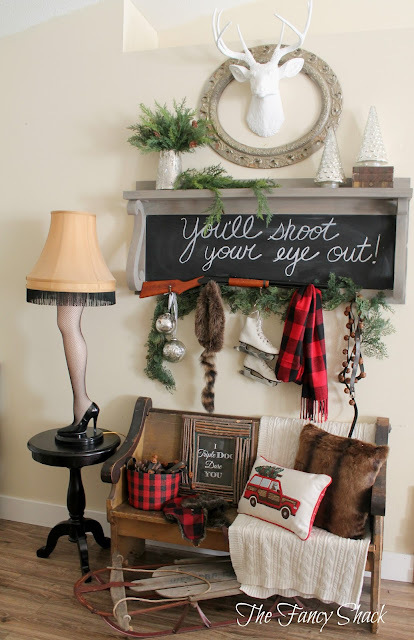 Love that leg lamp! It's iconic and timeless. Paired with some vintage accents, I'd love this space in my home immediately! 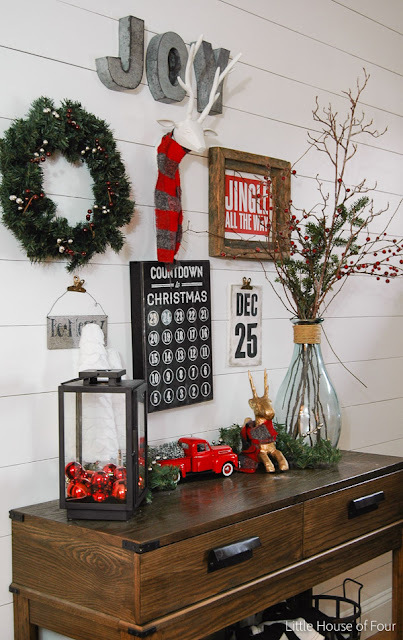 If you like this, Kimberlee from The Fancy Shack has an incredible Christmas home tour from last year! Check it out in the link below this image. This space is so pretty. 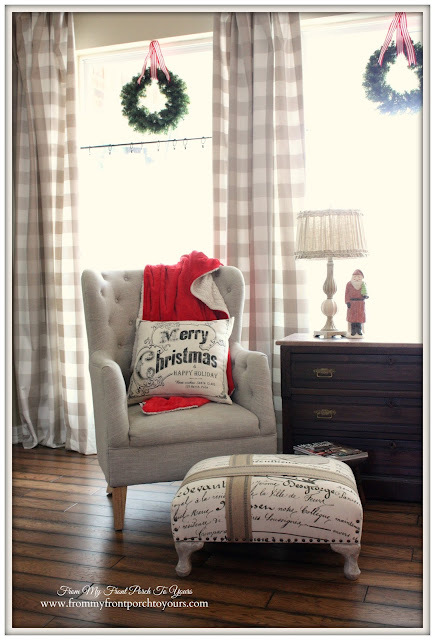 I love the check curtains and wreaths hung with ribbon. I adore that pillow! The whole space is so inviting. I love this space for sure. I love the vintage vibe from everything from the wall art to the table decor. That little red truck is so cute with the tree in the back! I really love this whole post. 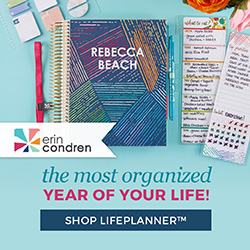 It essentially gives you awesome tips on decorating for cheap which really comes in handy this time of year when money is better spent on gifts. 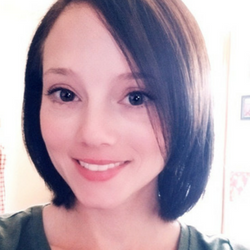 Check it out in the link under the image. 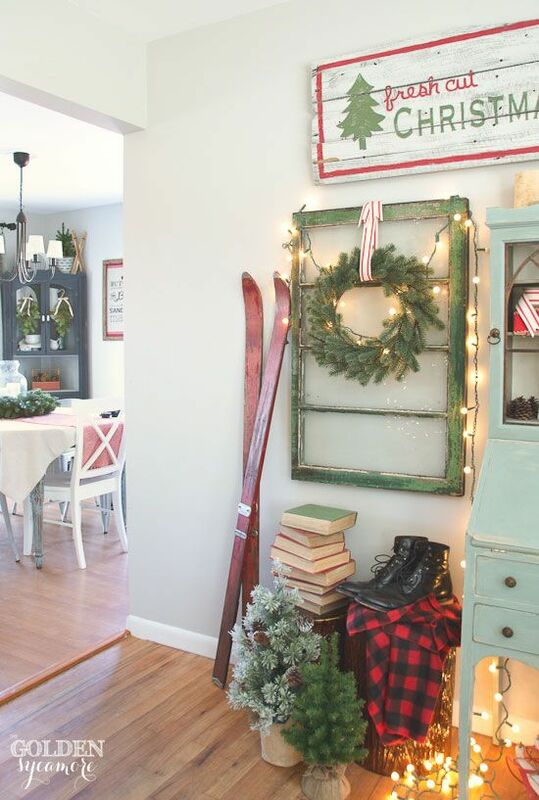 You don't have to live in the mountains to bring a little bit of that lodge feel into your home. I love those skis and that awesome Christmas sign! 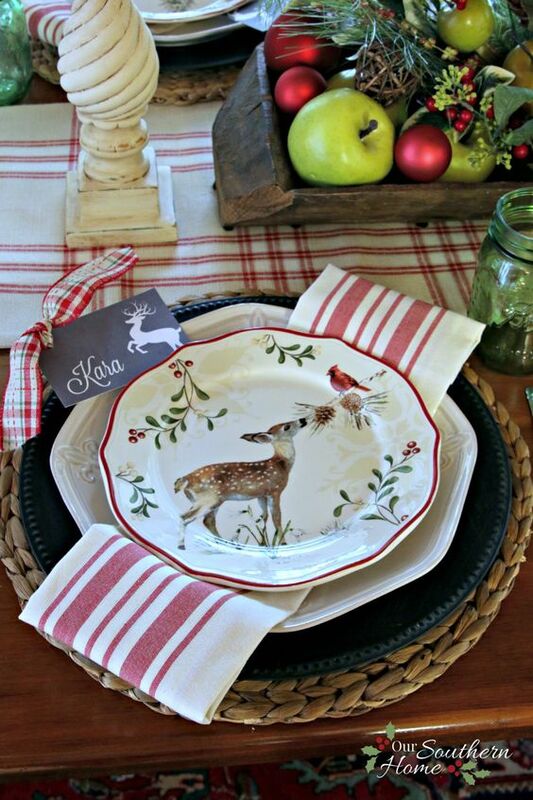 Looking for a beautiful way to dress up your Christmas dinner table? Oh how you will love this! 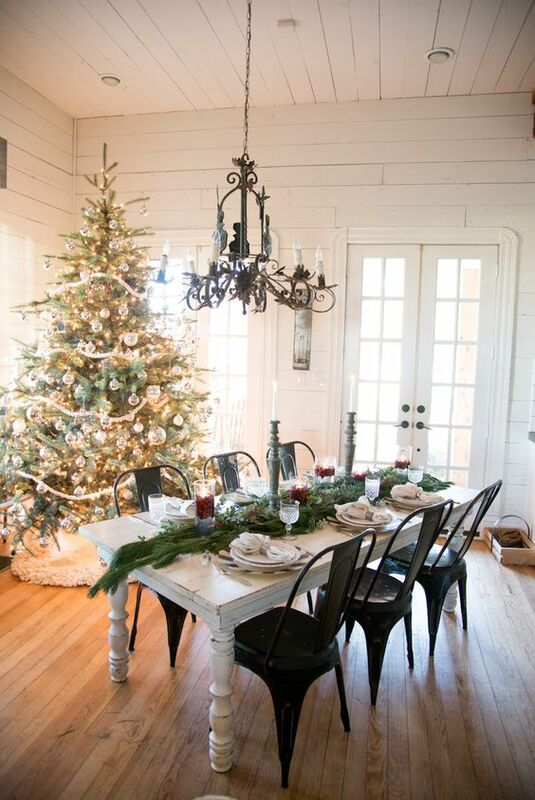 This whole room is amazing from the industrial style chairs to that big, beautiful tree. 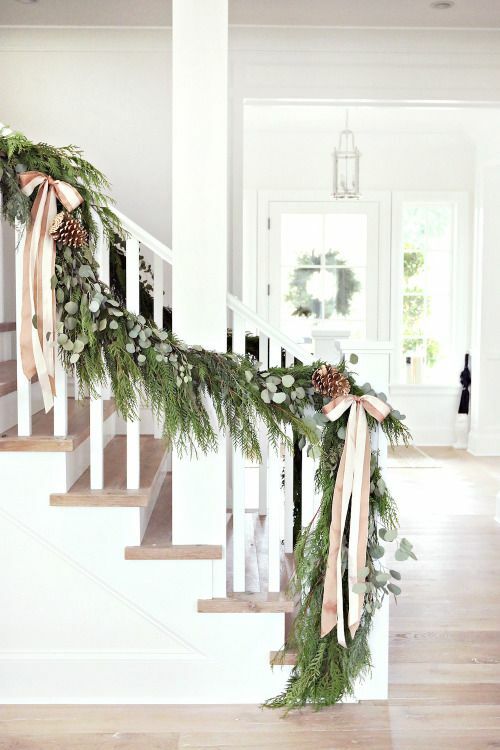 Add garland to your staircase and make it look like a million buck like this! I am amazed at how pretty this looks for how simple it really is. Well we covered the centerpiece for the table a few ideas above, but what about a place setting? The colors, fabrics and those cute little chalkboard place cards have me swooning! 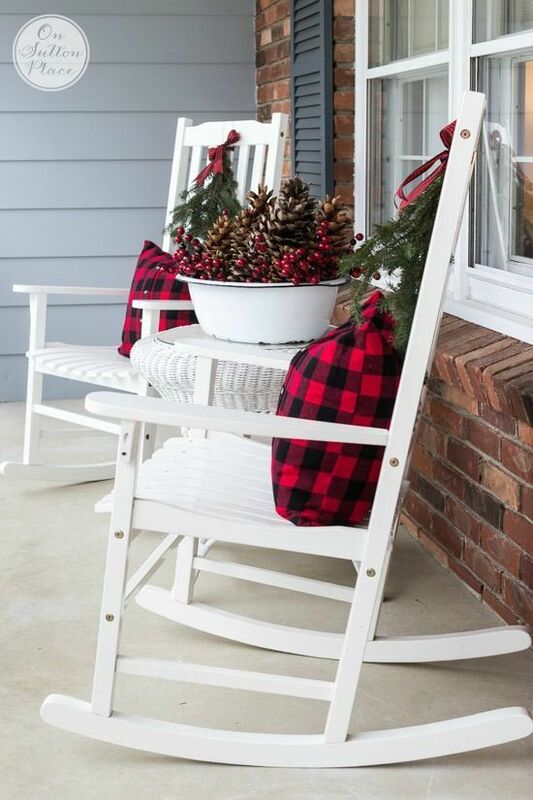 Not all of the holiday decor has to take place indoors and if giant inflatable Mickey Mouse characters aren't your cup of tea, tackle a more sophisticated approach to Christmas decor in your yard and porch by adding a few pillows to chairs and berries to a bowl. It screams "come sit down and get cozy" while also letting everyone know you love Christmas. Who says you have to store all of your furniture and decor when the Christmas decorations come out? Utilizing your existing decor accents adds character to your home without a lot of effort. 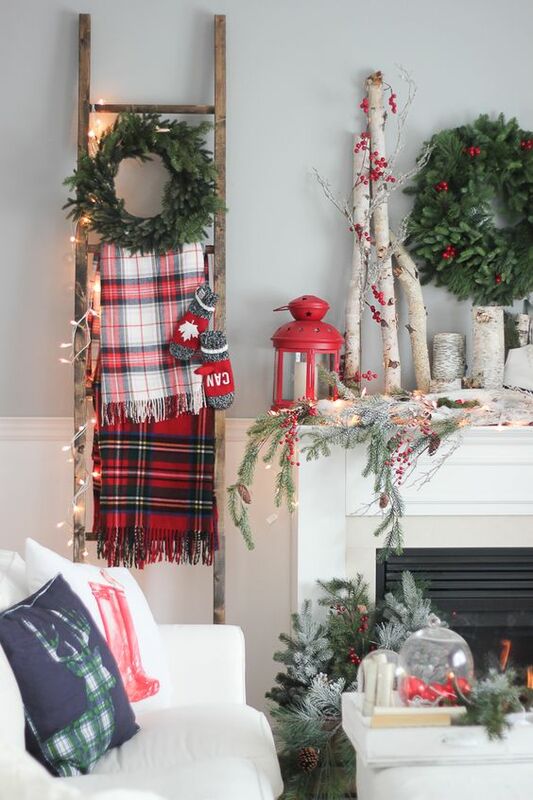 Add cozy Christmas print blankets to a ladder, lanterns to your mantle and pillow covers to your pillows (which save a boat load of space, trust me!). Such beautiful ideas! We are moving soon and I can't wait to try out some of these in my new home! I love the You'll Shoot Your Eye Out Chalkboard. A Christmas Story is my all time favorite holiday movie. Great ideas.